Air conditioning systems are found throughout offices, homes and commercial buildings and provide welcome respite from stuffy heat. Have you ever given a second thought to how these inventive systems work though? In this article, the experts at Airedale Cooling will give you an insight into the inner workings of your typical air conditioning system. An air conditioning system works in a cycle where a special substance – refrigerant – is repeatedly heated and cooled. Refrigerants have a low evaporating temperature which means they can change from a liquid to a gas relatively easily, absorbing heat to initiate this transformation and, as a result, cooling the surrounding air. To enable this transition to happen effectively and efficiently, the air conditioning system is comprised of four main parts. Your typical air conditioning system – whether a large commercial structure or a small domestic setup – has four main parts to it. Of these parts, the compressor and condenser are situated outside the property, the evaporator is inside and the expansion valve is situated in between. The compressor puts the refrigerant – which at this point is in a gas state – under pressure. As a result of the increased compression, the temperature of the refrigerant increases too. At the condenser, the refrigerant is cooled down and heat is allowed to radiate away outside your house/building. This results in the refrigerant returning to its liquid state. This cool refrigerant is then pumped into your property. The cooled liquid refrigerant is still at a high pressure when it leaves the condenser. As it travels through the expansion valve, the liquid is allowed to expand and its pressure drops. The low pressure liquid easily evaporates into a gas at the evaporator by absorbing heat from the room, thus cooling the air temperature. The A/C unit often houses a fan too so that the cooled air can be better dispersed around the room. The cool evaporator can also serve the purpose of dehumidifying the air. Humidity contributes to the temperature of a space, making it feel warmer. By cooling the overall air temperature, water vapour in the air condenses and many A/C units incorporate a moisture collecting pan for this reason. In summary, air conditioning works as refrigerant cycles through the system’s four steps: compression, condensing, expansion and evaporation. The refrigerant evaporates and absorbs the heat from inside your property, gets pressurised, and then expels the heat outside, condensing and cooling down again as a result. Airedale Cooling is an expert in air conditioning with over 30 years of industry experience. 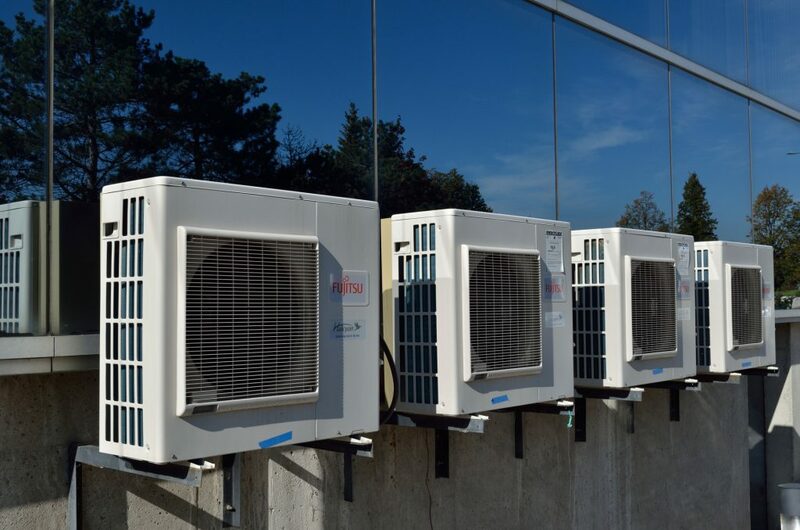 We offer customers high quality installation, maintenance and repair work for a wide variety of air conditioning systems. Our fully qualified team offer a friendly service and a high standard of workmanship, ensuring that your system is safe and efficient. If you have any enquiries, don’t hesitate to get in touch – we serve customers in Bradford and the extended Yorkshire region.